The unrest in Baltimore has fostered nationwide discussion about the root causes of the tensions in the city’s poor neighborhoods that led to an outbreak of riots and mass protests. While criminal justice policy and police-community relationships are arguably at the core of the present debate, the economic and social context in which those actions took shape matters greatly too. Yet media coverage has obscured a few key facts about economic and social conditions in Baltimore and other major American cities. The charts below situate the distress affecting neighborhoods like Freddie Gray’s Sandtown-Winchester against the backdrop of wider dynamics in Baltimore City and its metropolitan area, and in comparison to other cities and regions around the country. Far from a struggling post-industrial region primarily characterized by stagnant or falling incomes, the Baltimore metro area today is relatively affluent. Per capita incomes in the Baltimore region rose faster than in any other major metro area from 2000 to 2013. 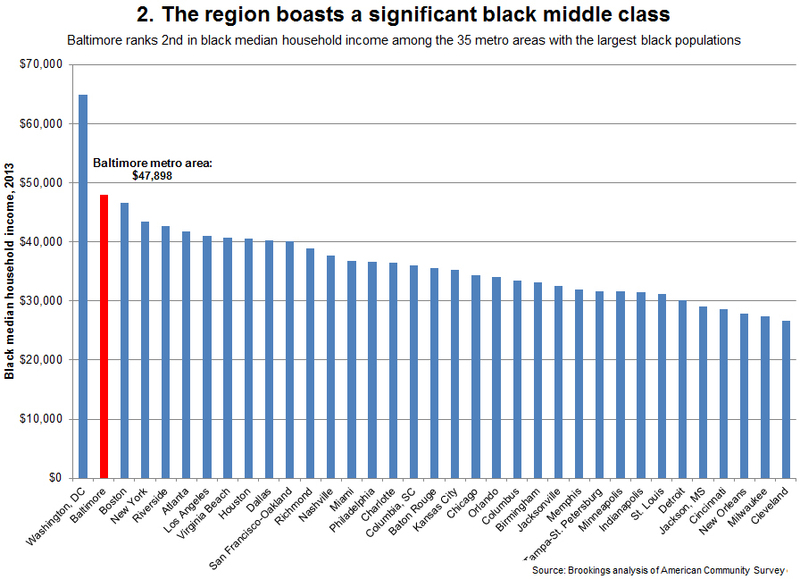 Regionwide, African American households share in that prosperity. 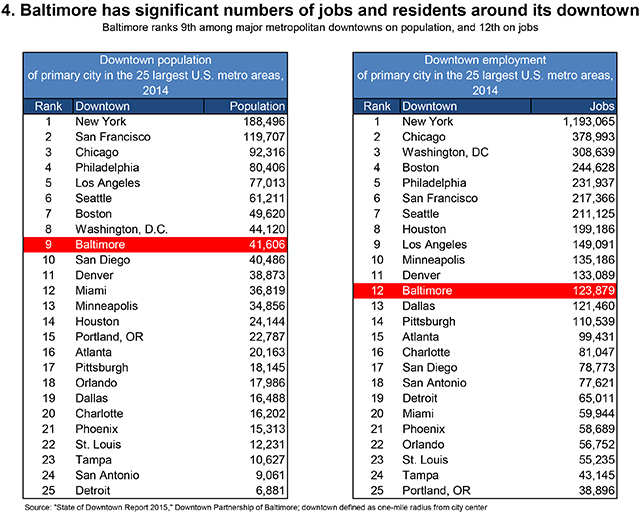 And the city of Baltimore itself boasts large numbers of high-paying jobs in industries such as education, health care, and professional services, particularly in its downtown core along the Inner Harbor and adjoining neighborhoods. 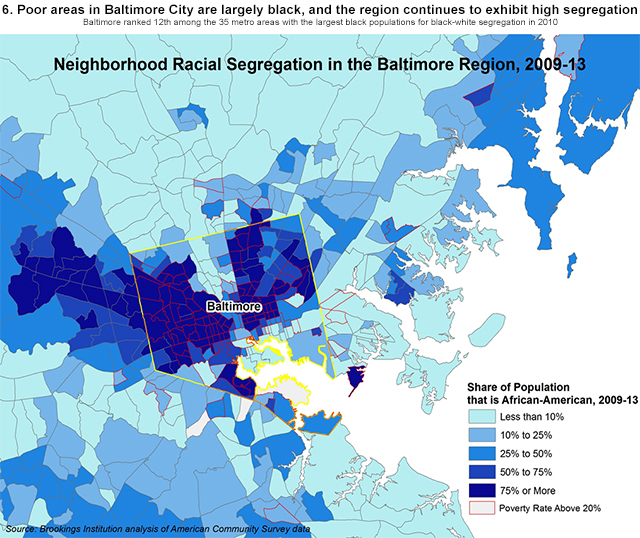 Within the city of Baltimore, deep divisions exist by race and place. 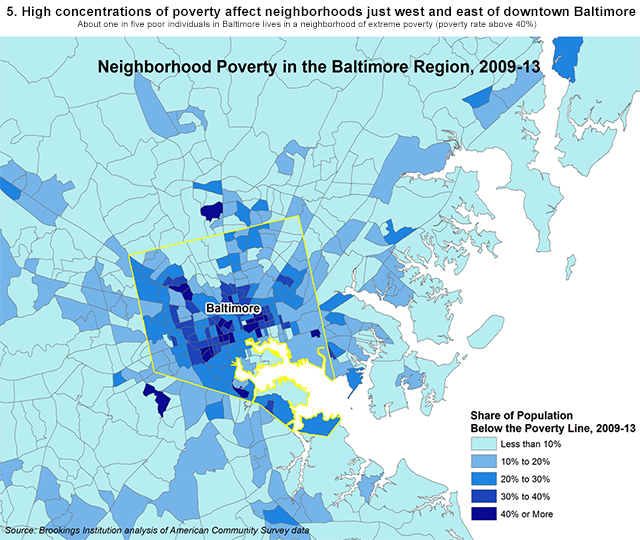 Neighborhoods just to the west and east of downtown Baltimore, including Sandtown-Winchester and extending out into suburban Baltimore County, exhibit very high rates of poverty. Those neighborhoods are predominantly black, reflecting a long history of explicit and implicit policies in the region that yielded high levels of racial and economic segregation. 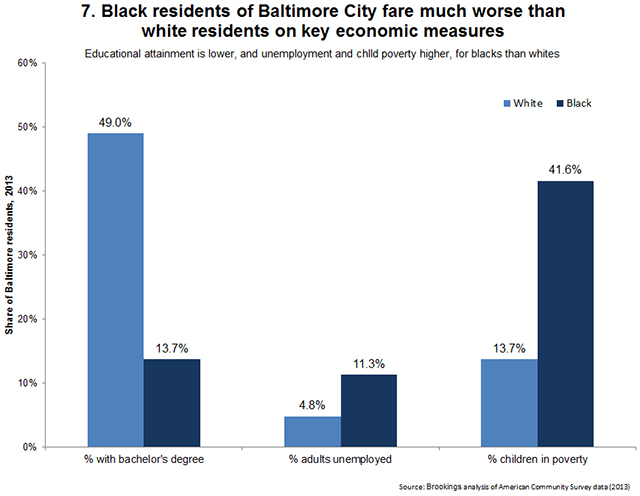 This racial isolation and poverty concentration help account for stark differences between Baltimore’s black and white populations in key economic outcomes like education, employment, and child poverty. In these respects, Baltimore is a typical American city. 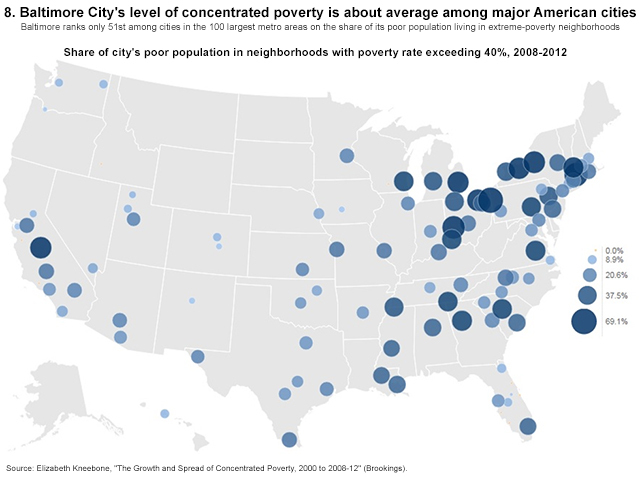 Its level of concentrated poverty is average among cities in major metropolitan areas. 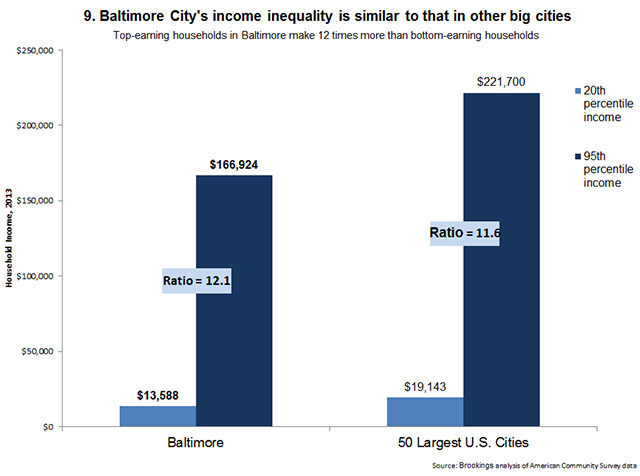 While Baltimore has a higher overall poverty rate than most other cities, its level of income inequality mirrors that for U.S. cities generally. 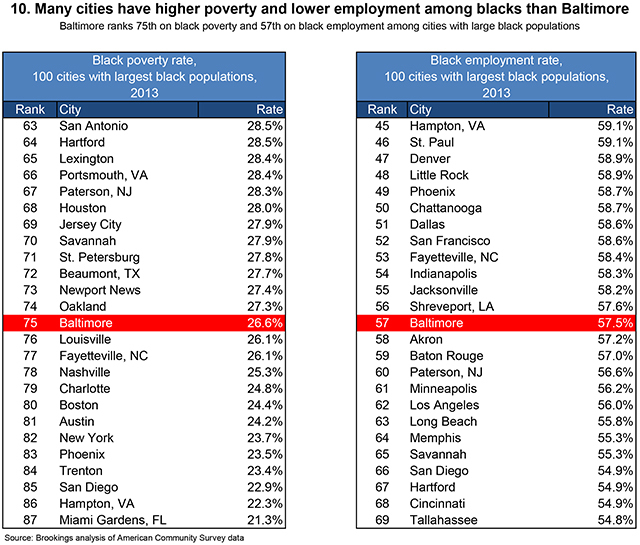 And Baltimore’s depressing outcomes for black residents on poverty and employment are actually better than those in a majority of other cities with large black populations. In sum, Baltimore is a region on the upswing economically, but one in which stability and prosperity are distributed highly unequally across racial and community lines. That is more or less the norm in metropolitan America today, and a stark challenge to economic growth patterns that have left too many behind for too long.